Russell Fleming, Content Manager, ME Association. Dr Karl Morten, Oxford University. Dr Karl Morten delivered a very interesting presentation with a number of welcome surprises to members of ME Auckland in New Zealand on Wednesday, 12th December. He spoke about the research into energy metabolism and metabolomics that is being carried out by his team in Oxford (and in Newcastle) with funding and support from the ME Association Ramsay Research Fund. And he provided a welcome update on the research we funded into assessing the commercial (Acumen) mitochondrial function test, as well as his team’s plans for future research. – Dr Morten and his team are in the advanced stages of making a grant application to the Medical Research Council (MRC) for £1.6million to study metabolomics in ME/CFS. If successful, this would represent the largest single biomedical grant ever given to this field in the UK. 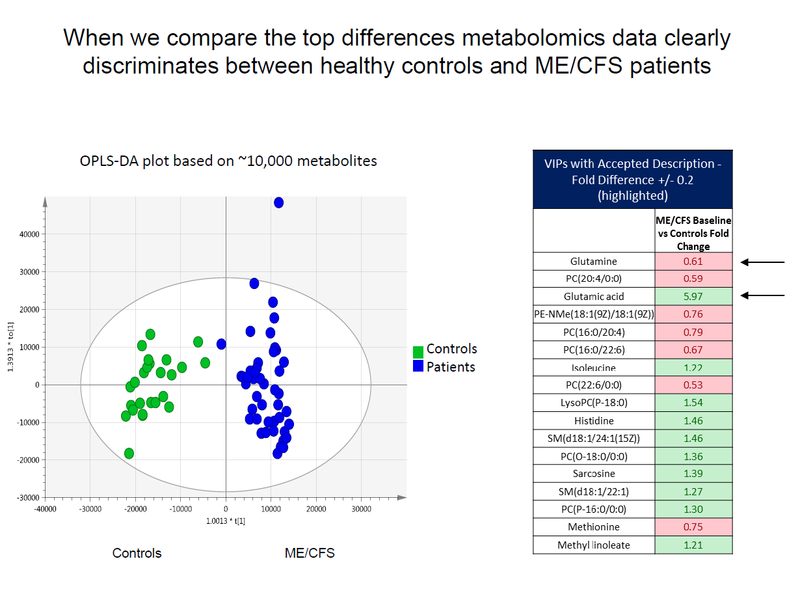 Researchers would analyse samples from over 1,000 patients who had a variety of diseases including ME/CFS to determine metabolomic differences. 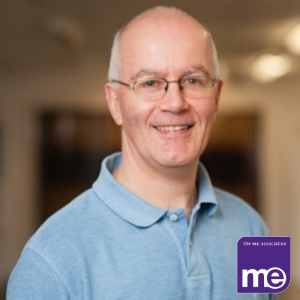 – The ME Association provided funding to Dr Morten and to researchers in Newcastle to try and validate the commercial Acumen mitochondrial test. This test is still being promoted as an aid to diagnosis in ME/CFS, but this much-anticipated research does not support its continued use and I look forward to publication early next year so that we might learn more. 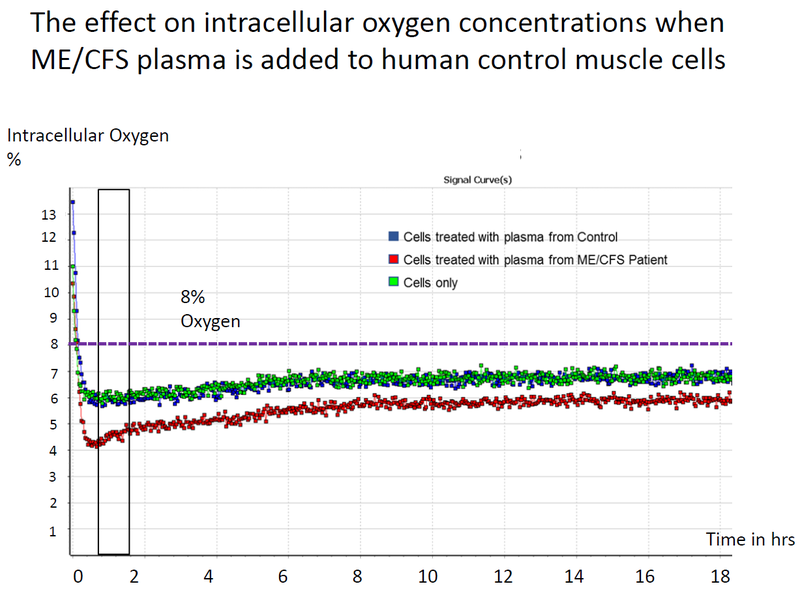 – Dr Morten revealed how when examining mitochondrial function, they took blood plasma from ME/CFS patients and added it to healthy muscle cells, and this resulted in a startling effect on the cells ability to absorb oxygen. They are continuing with work in this area and hope to determine why the energetics of the cells are affected in this way. – The work of Pawel Zalewski in Poland. Dr Morten and Prof. Julia Newton helped provide the Nicolaus Copernicus University with funding to enable Dr Zalewski to study the effect of whole-body cryostimulation on ME/CFS. We talked about this in our report of the 2018 CMRC conference, but this study will examine the effects of 10 days cryostimulation (10×3-minute immersions in extremely cold chambers) on cardiac, immune, and autonomic systems. The one-month results are very encouraging, but 12-month data needs to be collected before publication can be considered. – Metabolomics. 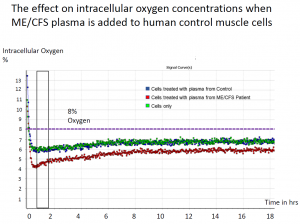 Returning to the Polish sample – which includes patients who have undertaken graded exercise to study its effects and features testing of aortic stiffness believed to be affecting autonomic function – Dr Morten and his team searched for metabolites (small chemicals) found in blood plasma. Using mass spectroscopy, they have found 37,000 metabolites in each patient sample using 4 different approaches. Approximately 11,000 of those metabolites appear unique. Although only 5% of these metabolites are known, they have been able to determine significance and work will continue to find out what the differences might mean. Metabolomics could provide for a diagnostic test. – The continuing success with Raman spectroscopy, which we covered recently in a research summary. 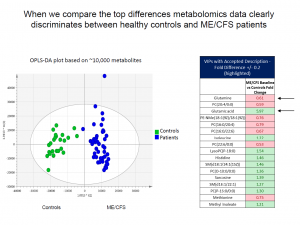 Dr Morten explains more about this fascinating method of analysis that is determining differences between ME/CFS and controls with quite remarkable accuracy. They are now looking at a further 50 patients and controls. – Research into the Ketogenic diet, which while in its infancy, appears to highlight different functional abilities between ME/CFS and controls during and after exercise. Dr Morten is not recommending the diet or the associated supplements that are available, but he feels this is another area worthy of study because it might be highlighting differences in energy metabolism. You can watch the presentation in full below, follow using the slides, or read the transcript taken from the video and kindly formatted by “strategist” on Science 4 ME Forums. We are very grateful to Peter and Levi Mancer from ME Auckland for producing the video of Dr Morten’s presentation and were more than happy to help cover the costs. Donate by phone using a card to head office (01280 818964). If you have any questions about the Appeal, then please contact our fundraising manager, Helen Hyland. Thank you.